The first thing that hit me in HK was the huge difference in metropolitan technology. Selene noted that the city has one of the biggest gaps between the ultra-rich and the ultra-poor. This creates a city that looks very much like the future. But as I told Eric, it’s like both good future and bad future. You know those movies that show society well into the future with flying cars, spaceships, robotic servants, and sleek metallic clothes? That’s the good future. Think: the Jetsons. But there are also movies that show the bad future… when humanity’s advancements also make city-life dark and dangerous. Think: Blade Runner. Well, that’s what Hong Kong is like. Good future + bad future. The buildings, trains and city look so beautiful from the outside, but once you get into certain areas of the city, it looks like the lower levels of Coruscant. If you’re a Star Wars fan, you know what I mean. 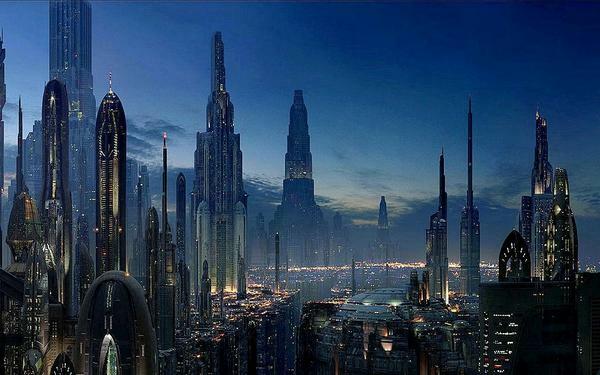 Coruscant: the capital city-planet of the Republic (and Galactic Empire). The whole planet is one big city, with spaceships, beautiful buildings, and millions of people. From afar, it looks like the perfect utopian city of the future. The Lower Levels. This is what Coruscant looks like below all the skyscrapers. The bounty hunters, smugglers, and working class hang out here. Many Jedi have had to take out their light sabers down here. I think part of the beauty of Hong Kong is that there are so many different people working to help the city to thrive. The tough part is seeing the difference between the rich and poor. In actuality it’s not filled with bounty hunters and smugglers (and is not dark and dangerous), but you definitely can see the ultra-rich drive around in their European import cars while the working class stocks vegetables at their ground-level stores. Real life Coruscant: Hong Kong. 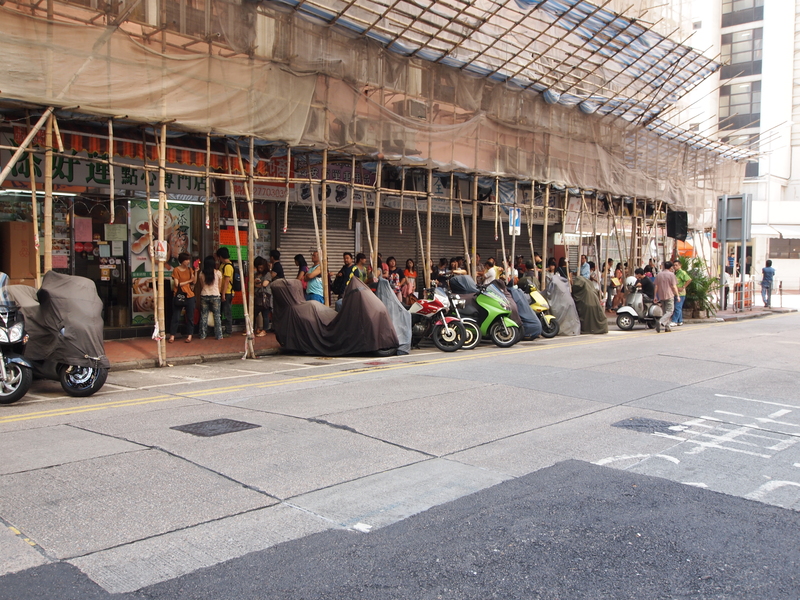 We ate some great Dim Sum at this Michelin star joint near our hostel. We got there before it opened, and it’s a good thing we did. By the time we got a table, the line was down the block! This line was on a weekday morning! 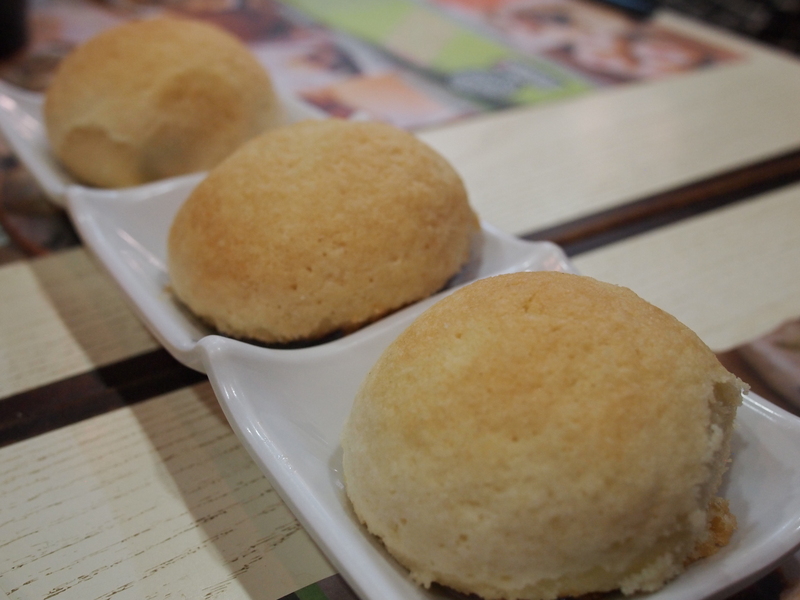 They had these really interesting chashu baos there. I love chashu baos. These had a crisp sweet coating on top of the bao… and they were filled with delicious bbq pork. WOW. We loved them so much, we ordered a second set. Chashu bao. These will be served in heaven, I promise. 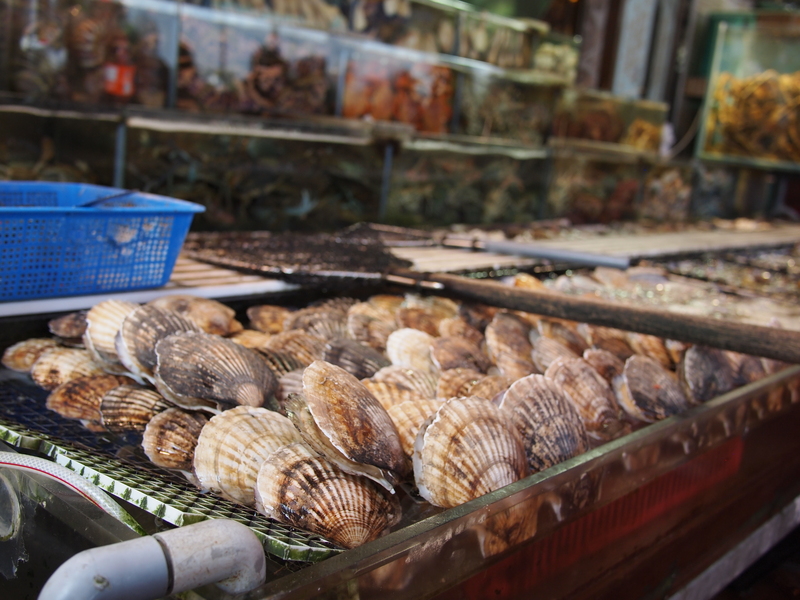 From there we headed to Sai Kung to walk around and get some fresh seafood. It was a 40 minute drive by bus to a beautiful ocean cove filled with smaller islands. It was a quieter fishing area compared to downtown. 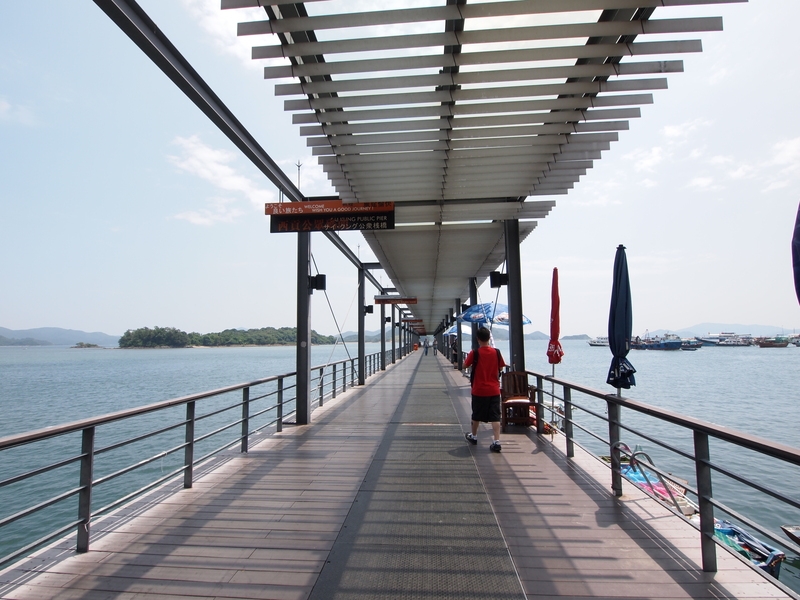 The pier at Sai Kung. A little bit of “future” in an old harbor. Floating Fish Market. The people in these small boats had tons of fish in plastic bins with water cycling through them. People would come up to the side of the pier and buy fish from them. After you buy the fish, the lady will clean it and salt it for you. Take your pick! They even have blue crab off the side of the boat in a cage tied to the side. But we didn’t get our fish from the boat. 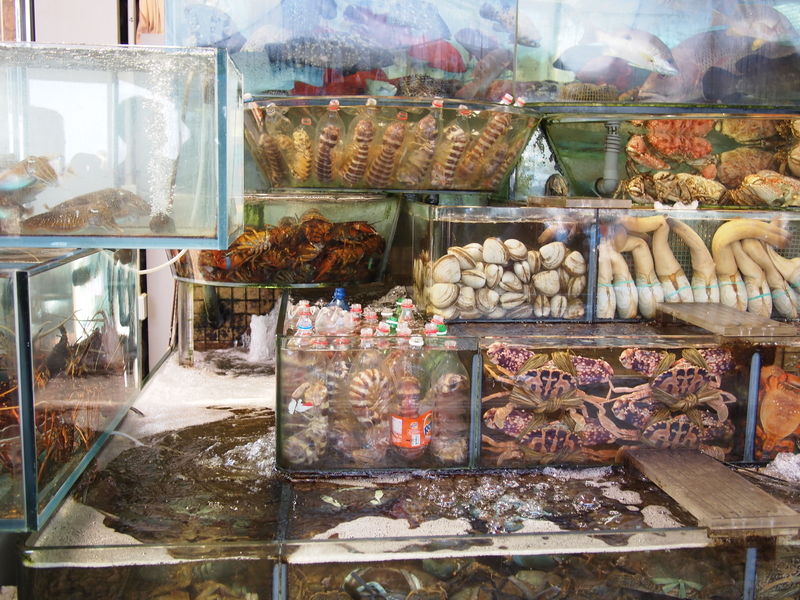 Instead we came here, and picked a crab from one of these bins outside. Actually, Selene picked it. She’s the only one that spoke fluent Cantonese, so that makes her the crab-picker. There were tons of fish, shellfish, and other “creatures” there. I had no idea what 70% of them were. 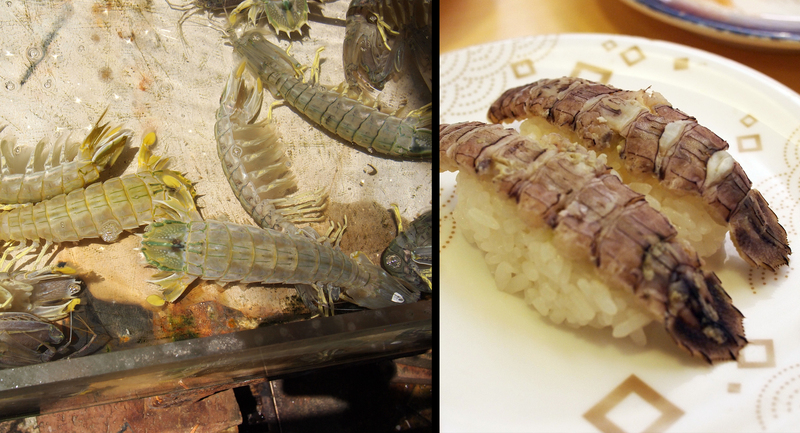 They even had shrimp-like animals INSIDE plastic bottles. WHY?! I’m thinking they were farmed inside the bottles from a young age, because I have no idea how they would get full-grown ones in there. If they did farm them, that’s just wrong. I can’t believe I feel bad for a shrimp… but I do. Before & After. 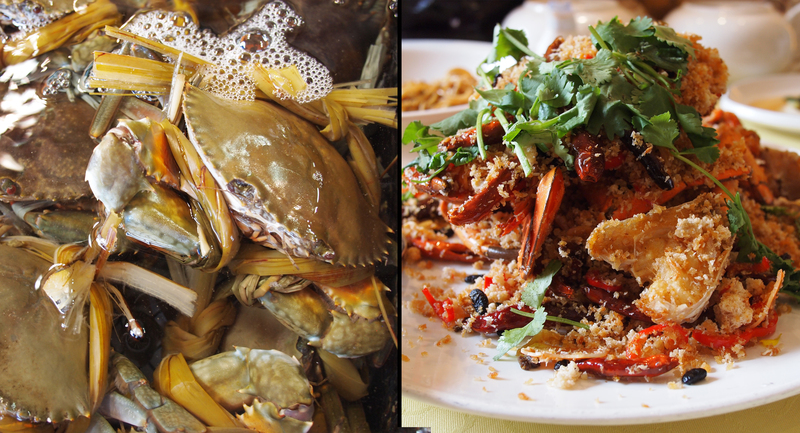 the crab on the left became the crab on the right. deep fried garlic covered the crab like freshly fallen snow. so delicious! Before & After 2. In Japan I ate the sushi on the right, but nobody knew what animal it was. 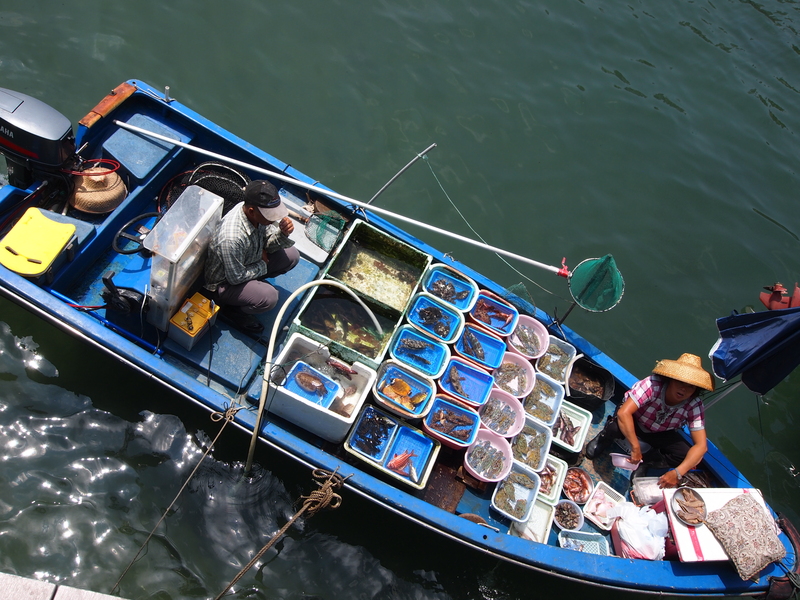 Then I saw these (left) at Sai Kung. I think they’re the same. They look gross. They taste ok… but let’s just say I’m not going to order it again. We stopped at a dan tat place after lunch. Aside from Selene, this is the reason I came to HK. 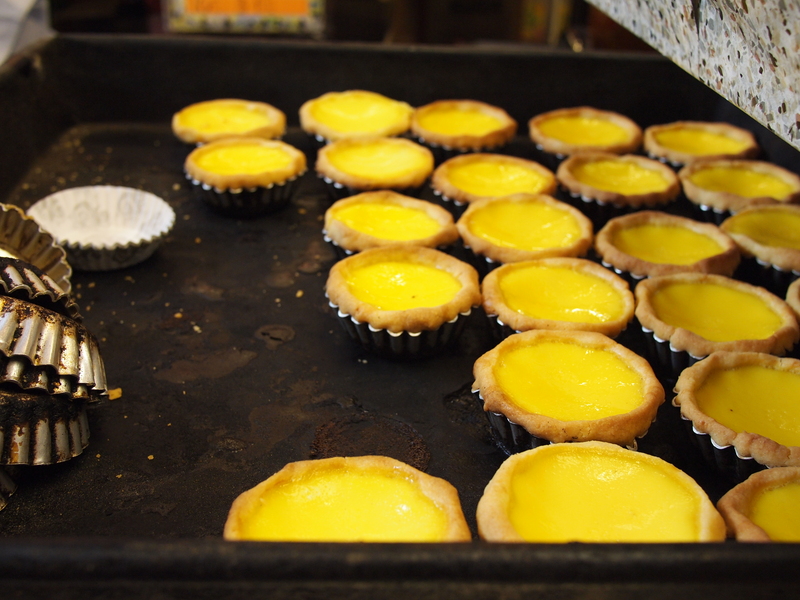 I heart egg tart. There was more that happened on day 1, but I’ll save that for post 2: Day1B. 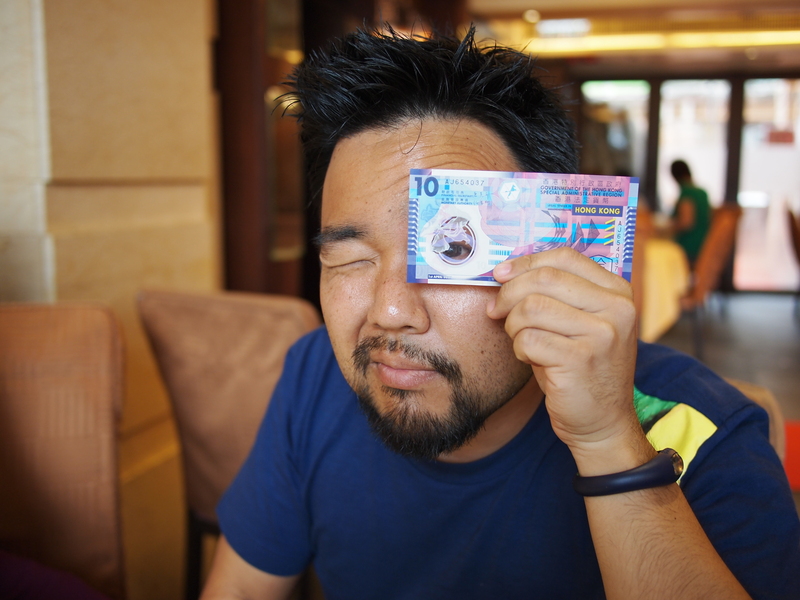 I leave you with this cool pic of the HK $10 bill. It has a clear window in the center of the bill! Why is US currency so boring? You can see through the bill! HK money is so cool.